Matthew B. McClure Jr. circa 1892. 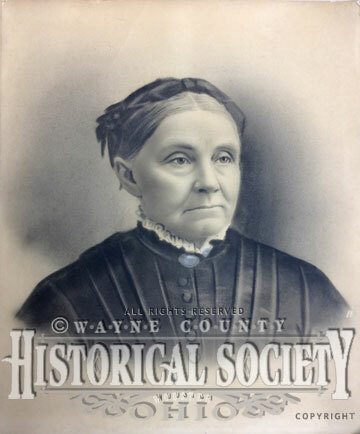 Hidden underneath a stack of old newspapers on top of a filing cabinet waiting to be sorted, were two eye-catching portraits in the Wayne County Historical Society’s Documents Vault. The catalog numbers handwritten on the back indicated they were images of Matthew McClure Jr. and his wife, Elizabeth (Funk) McClure, and were categorized as “Fine Art”, donor unknown. 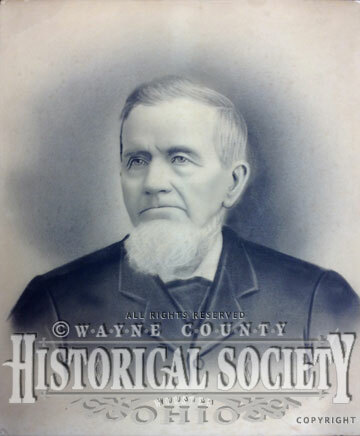 After a quick trip to the Wayne County Public Library’s Genealogy Department I learned that Matthew McClure Jr. was a son of Matthew McClure Sr. and Maria (Brandon) McClure. He was born in Dauphin County, Pennsylvania on September 19, 1819 and came with his family to Wayne County, Ohio about 1823 where his father, Matthew McClure Sr., established the McClure & Co. business in downtown Wooster, Ohio that dealt in furnaces and boilers for hot air, hot water, and steam heating purposes. They also carried bath tubs, and bath room supplies, and everything necessary for any kind of plumbing: gas or steam fittings. Furthermore they did slate and tin roofing and tin and galvanized iron work of all kinds. However, by the time Matthew McClure Jr. came of age he showed no interest in his father’s business. He married Elizabeth Funk on November 10, 1842 and they lived together on a farm 3 miles southwest of Wooster, possibly on part of the farm owned by his father. Matthew and Elizabeth McClure had 12 children but tragically 7 of those children died very young and close together from scarlet fever. During the Gold Rush of 1849-1850 with 3 children at home and one on the way, Matthew McClure Jr. caught gold-fever along with relative J. McClure and joined the Captain L. M. Dennison company organized aboard the Steamer, Consignee, bound for St. Joseph, Missouri. From which the Dennison company, consisting of 259 men and 1 female, with 131 of those men from Wayne County, Ohio, planned to cross to the west coast by wagon train to seek their fortune in California. McClure never gave many details about his gold rush experience but was once heard remarking that he found a body full of rheumatism in a place of gold. He came home by boat from San Francisco to Panama and it was reported that on this part of the trip the boat became becalmed (adrift with lack of wind to power the sails) and many passengers died for lack of water and food. When he finally reached Panama he walked across the isthmus on crutches to catch another boat to New Orleans and back to Ohio by way of the Mississippi River to Cincinnati. It was rumored that he had secured some gold as a forty-niner for he once said that he came home with just as much money as when started for California. Matthew McClure Jr. eventually moved his family to the village of Bloomington (now part of Wooster) where he engaged in raising strawberries, asparagus, and small fruits. He and Elizabeth celebrated their golden wedding anniversary in 1892. I would guess that the portraits of Matthew and Elizabeth McClure in the WCHS collection were done in honor of their 50th Wedding Anniversary. However, that is only conjecture on my part with no substantiating evidence found. Elizabeth (Funk) McClure circa 1892. I am no expert on “Fine Art” but the portraits look more like lithographic prints and didn’t strike me as a work strictly produced by hand drawing or painting methods. Furthermore, there was no artist signature on either portrait. To my eye they really looked like photographs that had been manipulated in some way. There was a style of photography, Pictorialism, that thrived from about 1885 to 1915 in which the photographer somehow manipulated what would otherwise be a straightforward photograph as a means of “creating” an image rather than simply recording it. Typically, a pictorial photograph appears to lack a sharp focus (some more so than others), is printed in one or more colors other than black-and-white (ranging from warm brown to deep blue) and may have visible brush strokes or other manipulation of the surface. The McClure portraits show a number of the Pictorialism features: fuzzy focus, brown tint (although this could come from aging), a hint of brush strokes on the lower right-side sleeves, and the blue colorization of Mrs. McClure’s broach. Whether the McClure portraits are, or are not, an example of Pictorialism photography is questionable, but there is no doubt they beautifully captured their appearance during the time they lived. Elizabeth (Funk) McClure died peacefully on April 15, 1894. Matthew B. McClure Jr. died on March 12, 1899. Both are buried in the Wooster Cemetery in the family lot together with 9 of their 12 children, 2 grandchildren, and one daughter-in-law.